If you are not familiar with TED Talks, it is a nonprofit devoted to spreading ideas, usually in the form of short, powerful talks by influential speakers. There are over 3,000 TED talks and some are of course better than others. 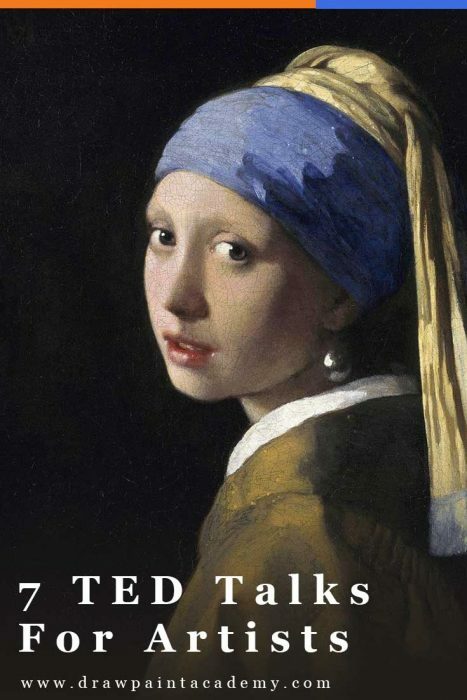 In this post I feature some interesting TED talks that I feel are relevant to us artists. The speakers are not all artists themselves, but they share some great ideas for helping us harness our creativity. If there are any TED talks for artists which I have missed, feel free to share in the comments. This talk by Tracy Chevalier takes a deeper look at analyzing and appreciating art. She touches on why we tend to leave art galleries feeling unsatisfied and overwhelmed after not actually taking in or appreciating any of the individual paintings. She provides some valuable insights into three paintings; Girl with a Pearl Earring by Johannes Vermeer; Boy Building a House of Cards by Jean-Baptiste-Siméon Chardin; and a painting by an anonymous artist. Key takeaway: Instead of just touching on the surface of many paintings, try to narrow down on the few which truly interest you and catch your attention. Think about the story behind the painting, why the painting interests you and what the artist was thinking when they created it. This talk discusses the lack of emphasis on creativity in education. I tend to agree. Sir Ken Robinson suggests that creativity is just as important as literacy and math and should be treated with the same importance and relevance. He believes society is currently educating people out of their creativity by focusing on avoiding mistakes, rather than trying new things. Key takeaway: Be open-minded to criticism but do not let it stifle your creativity. If you are not making any mistakes, then you are not being adventurous enough. Adora Svitak is a child prodigy who claims the world needs to embrace "childish" thinking, which is filled with bold ideas and unbridled optimism. She suggests that the wild dreams and aspirations of children need to be encouraged and that adults need to have a willingness to learn from children, rather than only teach them. Key takeaway: Learn to encourage your own "childish" thinking, rather than keep it locked away in your head. Phil Hansen has tremors which prevent him from drawing with "spot on" accuracy. He discusses how you should embrace the artistic style which suits you, rather than defaulting to the "right" way of doing things based on how others draw and paint. This way of thinking changed the way he created art. He adapted his art around the tremors and embraced his limitation, rather than letting it prevent him from reaching his goals. Key takeaway: Do not feel bound by your limitations. If you cannot paint accurately, then focus on color and expression. If you cannot see color, then focus on value and composition. Instead of focusing on the things you cannot do, focus on the things you can do. Jarret Krosoczka is an author and illustrator who talks about his journey from a child who wanted to pursue his passion to draw and write stories. He talks about how using your imagination and creativity was encouraged whilst he was growing up, but in today's society it is not. He mentions how art is currently limited in education, if at all present and that this is preventing kids from using their imagination and creativity as an outlet. He also mentions that you should draw or paint in your own style and ignore what others are telling you. "Just do you". Key takeaway: Find a passion and pursue that passion. This talk really hit home for me since I consider myself an introvert. Susan Cain mentions that introverts are not necessarily shy and that introversion refers to how you respond to stimulation, including social stimulation. Extroverts crave stimulation, whilst introverts work best in quiet, more low-key environments. She goes on to talk about how society builds environments which are catered to extroverts and that introversion is not really considered the right way to go. Our schools and workplaces emphasize being loud and outgoing. Desks are arranged at schools so that they are all facing each other in groups. Workplaces are mostly becoming open-plan. If you do not enjoy working in these environments, it is often suggested that you are the problem, not that the environment does not suit you. She talks about how she denied her own introversion and became a lawyer, rather than the writer she always longed to be. How she made "self-negating" choices like going out to crowded bars when she really just wanted a nice dinner with friends. She claims that the "world needs introverts doing what they do best". To maximize your talents, you need to put yourself in a place where you are most comfortable working. An introvert does not usually work well in an environment suited to extroverts, and vice versa. Key takeaway: "Solitude matters". If you are an introvert, then to maximize your potential you should place yourself in introverted environments. Stephen Duneier is not an artist, but I found this talk to be useful for the overall learning process and goal setting. He explains how you can accomplish your most ambitious goals through small, incremental improvements each day. Key takeaway: Set goals and do something every day. Instead of looking at a painting by Michelangelo and thinking.... "well I could never do that", take that first step and start practicing. I enjoyed listening to Tracey Chevalier and her story about the girl with the pearl earring! Re: Do Schools Kill Creativity by Sir Ken Robinson, Schools today are FULL of turmoil. I know. I am a recently retired ART teacher. I also know that there can be NO creativity where there is no peace. Until schools get control of the negative elements enough that peace can be attained in the classroom, there will be little creativity. Yours is an interesting and thought provoking comment that links creative expression to a controlled environment. I have considered that universities have moved from being stimulators of creative thought for some time, to become destroyers of creative thought, by placing intellectual blinkers onto students. I then wonder whether the unattractive unruly behaviour that disturbs you so much is the unrecognised creativity of those you apparently struggle with so much. When I attended primary school it was staffed by many who were sadists who exercised classroom control via a cane and a strap, to inflict abrasion and bruises on perceived non-conforming students. Consequently I couldn’t wait to depart the ‘hallowed halls’ as soon as legally possible, to only later realise that I required the magical ‘piece of paper’ for entre to the world of business and financial success. Then much later I found my own way to artistic expression and higher satisfaction. I really enjoyed listening to “Embrace the shake” by Phil Hanson. My hand shakes sometimes and I become frustrated. After watching his talk, I now have a new perspective. Thank you for providing this opportunity. I really enjoy your emails on painting tips. They are very helpful and some of the best. I somehow deleted the last one that you sent out a day or so ago. It gave some great tips on mixing paints and what different thinners to use and other great suggestions. Is there any chance you can send it to me again. Would be much appreciated. Would really like to see the guidance on mixing paints and the various thinners used.